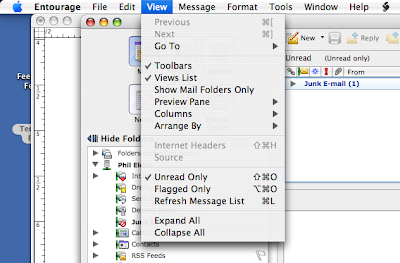 Working in Entourage though, the Mail View for Unread items does not work that way out of the box. So, after going through all of the "Unread" email, one would expect them to "disappear". They do not! They stayed there grayed out indicating that they are read. On a busy day, that can start to get irritating. So, off to figure out how to make the read Unread emails "disappear" after reading them. An option under the View menu that can be toggled to show unread email only in the Unread folder - or any other folder for that matter. After toggling the unread only view on, voila! No more read Unread messages.